We have been fortunate enough to have had National, State and Local videos produced. We also have annual publications, salutes and written articles to view below. 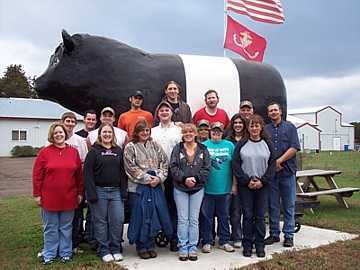 Wisconsin River Meats on the Food Network! See our featured segment on the Food Network's television hit series "Unwrapped" Episode CW 1901 titled "Summer Snacks"
All of us here at Wisconsin River Meats were honored to have a national television network visit us for a day of filming and interviewing. This video is a general overview about our business including our store and some of the different products and services we offer. Wisconsin River Meats featured on Discover Wisconsin's television show episode Mauston - Four season's of fun. The host Stephanie Klett participated in making the famous smoked sausage landjaeger and the production crew filmed all day. Everyone had fun. The art of sausage making. 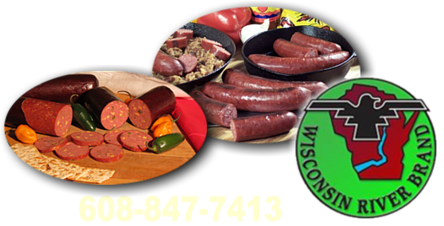 Watch this piece filmed by the Discover Wisconsin television show production team on Wisconsin River Meats famous Landjaeger and other homemade smoked sausage. This short film is a short blooper reel made by the Discover Wisconsin television show production team after filming footage all day long. Many takes, many cuts and laughs for a fun day by all involved. What The Heck is a Landjaeger? Here is a nice video of Wisconsin River Meats filmed by some high school students as part of a project focusing on local business. Filmed and produced by Lydia Bergeson and Kelsey Murray under the supervision of Gil Saylor and Eagle Vision Productions. Below is a snap shot from the Landjaeger filming where some of Wisconsin River Meats employees get to yell "Summer Sausage!!" Wisconsin River Meats and the television show Discover Wisconsin's host Stephanie Klett discuss different tastes of various products all produced at Wisconsin River Meats. Service Area: Mauston, Baraboo, Sparta, Waunakee, Reedsburg, Black River Falls, Nekoosa, Wautoma, Pardeeville, Sauk City, Cross Plains and surrounding communities.